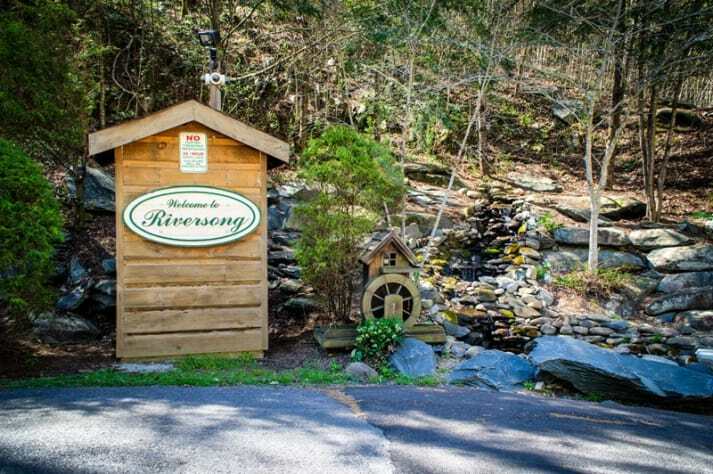 Welcome to Mountain Serenity! 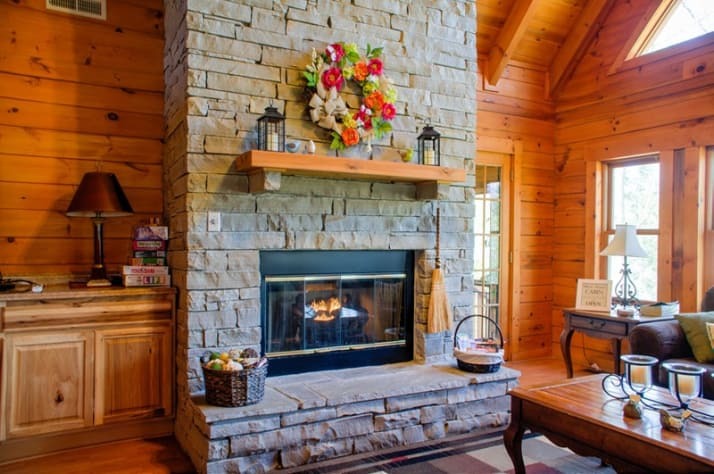 Our luxury log home offers a beautiful, peaceful, private property, yet minutes from everything. 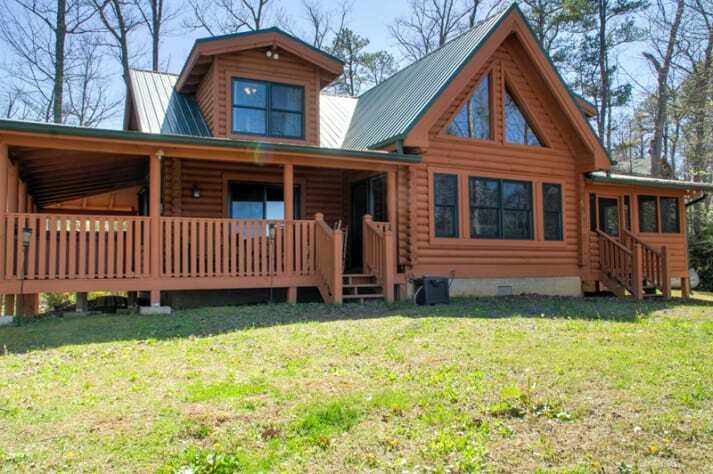 This 3 bedroom 3.5 bath home provided relaxing accommodations as well as majestic mountain views. 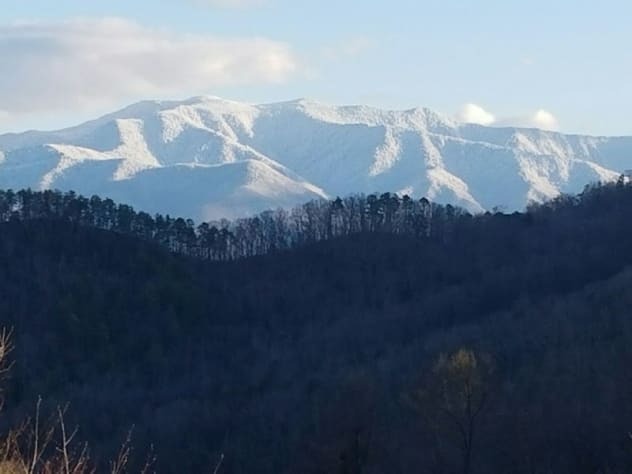 It is conveniently located only 8 miles from downtown Gatlinburg, 6 miles from the Arts& Crafts District and 12 miles to the Great Smoky Mountain National Park. 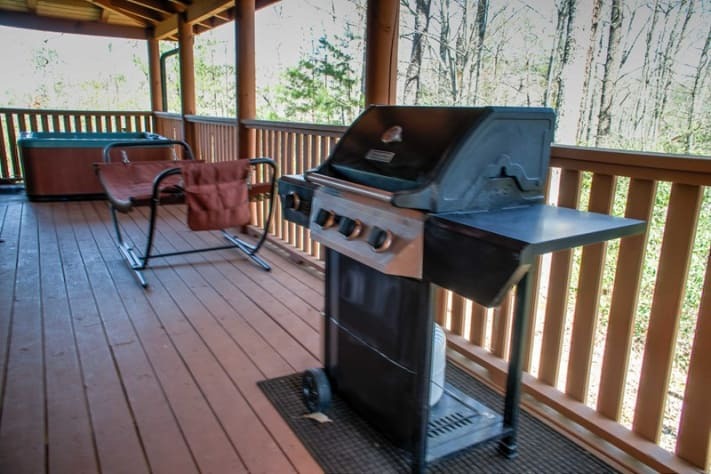 It will surpass your expectations for your Gatlinburg vacation and provide everything you need plus so much more for example, fireplace, hot tub, screened in porch off the Master and a fire pit in the backyeard. 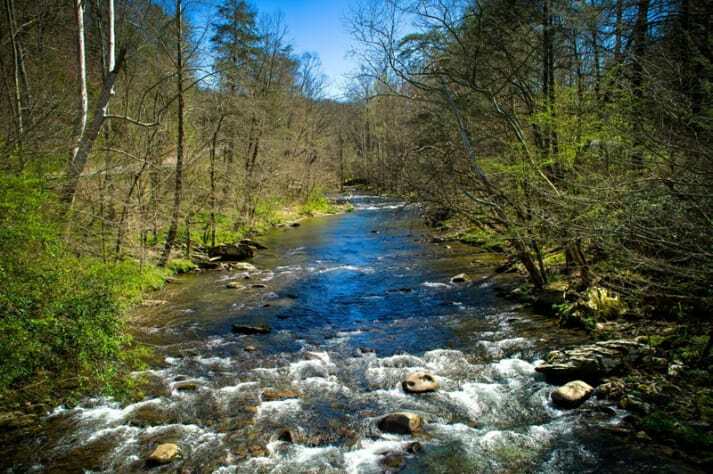 And for all of you fishermen, the cabin is only 1/3 of a mile from the Little Pigeon River, which provides amazing Trout fishing. Bedrooms: Sleeps 6 There are 3 bedrooms. 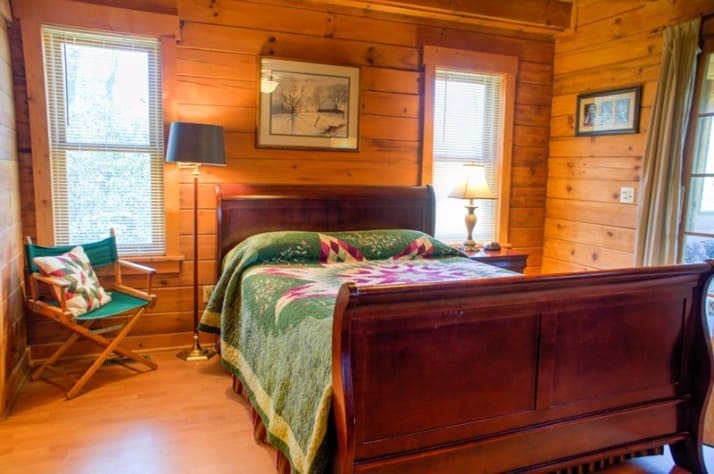 The master bedroom is on the first floor with a comfortable queen size bed and an attached bathroom. Enjoy the TV with the DVD or VCR in the comfort of the master bedroom. 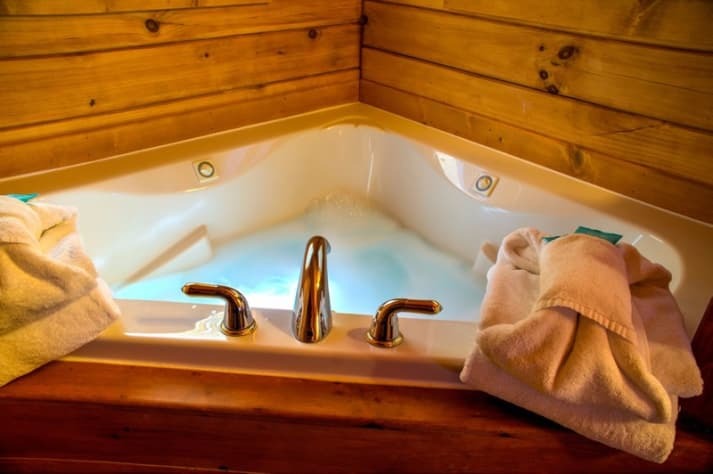 The bath has a large jacuzzi tub and a walk in shower. Bedroom 2 and 3 are upstairs. Each has a Queen bed and an attached bathroom. 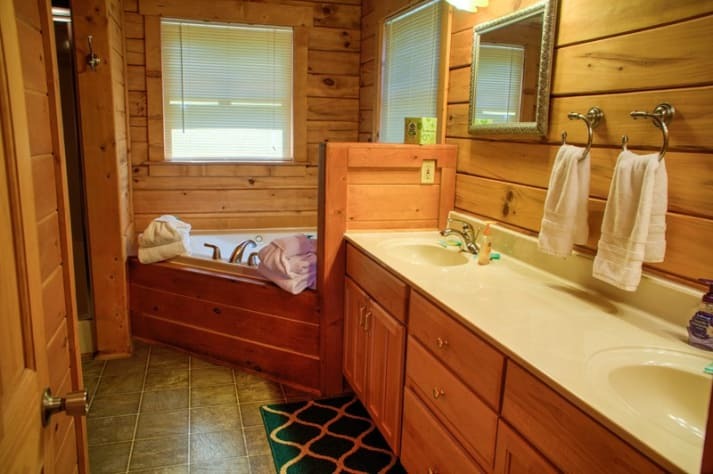 Bathrooms: This cabin 3 and half baths. All 3 bedrooms have an attached bathroom. There is a half bath on the first floor. Kitchen/Dining Room: The large open kitchen is fully stocked for all your cooking needs. There are 2 stool, at the kitchen island bar, or enjoy the comfortable dining table with seating for 8. Family Room: The family room has vaulted ceilings and a private mountain view. Enjoy the gas fireplace on those cool nights during the winter. Or, watch a favorite show using our satellite system or a favorite movie. You can also use the sleeper sofa if you need more sleeping arrangements to accommodate a total of 6 people. 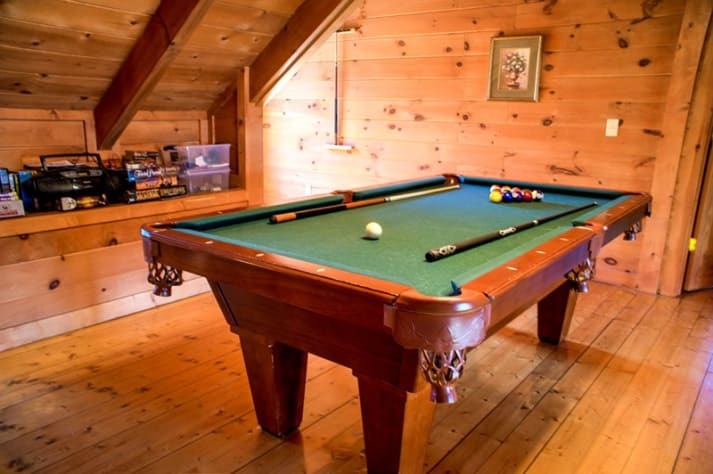 A pool table in the loft above can be seen from the family room. 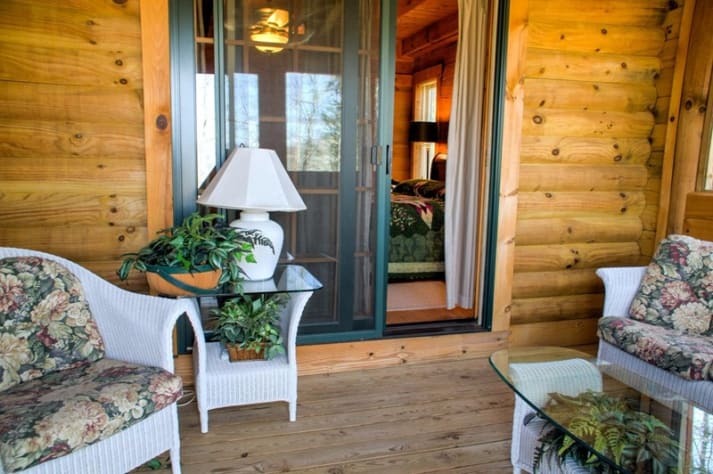 Screened-in porch: The comfortable wicker furniture is the perfect place to relax after walking around downtown Gatlinburg. 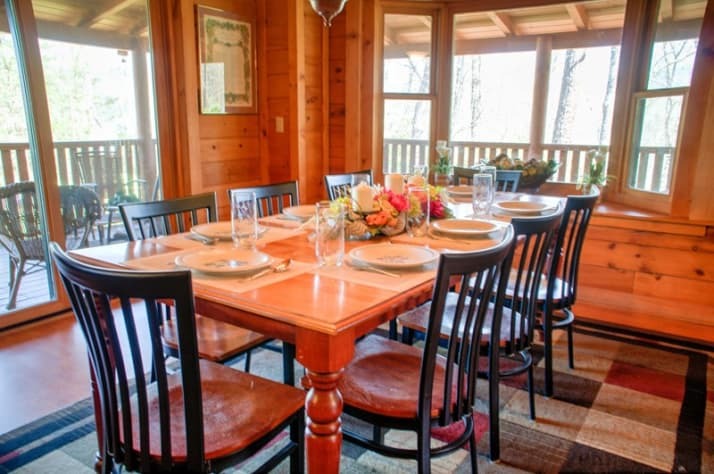 From the screened in porch you can look over the nice yard, a rarity in the Gatlinburg area. You can also access the walk around deck to the rest of the cabin. WIFI is available for you to use while there. Mountain View: View the mountains from inside the cabin through the huge glass windows, from the screeened-in porch off the Master Bedroom, from the hot tub on the outside deck or while sitting around the Fire Pit. Soak in the beautiful view year round from inside and out. Lives up to its name! Serene! Thouroughly enjoyed our stay at Mountain Serenity. The fire pit was outfitted with comfortable chairs and the gorgeous views made for an amazing backdrop. The covered porches were so comfy and the perfect location for morning coffee or late night talks. Also enjoyed the indoor gas fireplace that was so easy to use! The cabin really lends it self to providing spaces for respite. Everything you need and more all in one place! Would definitely return! Great cabin!! Cozy with a beautiful view. Lovely owners. The perfect weekend getaway. We will definitely be back! This was my first time to the Gatlinburg area and absolutely loved this house! I was there for a girls weekend and we had the best time! 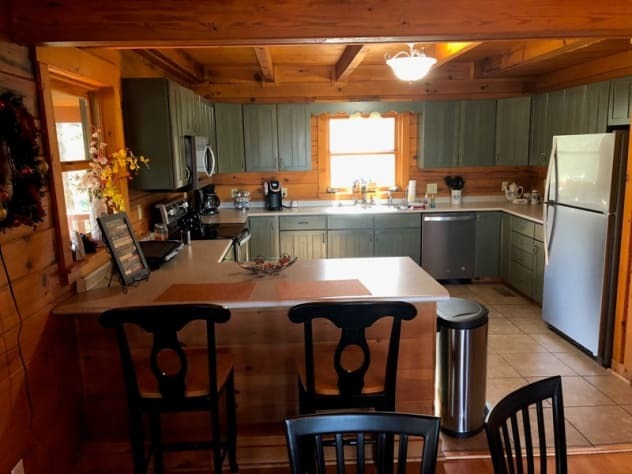 Plenty of room, great kitchen area, comfy beds & gorgeous views out back! 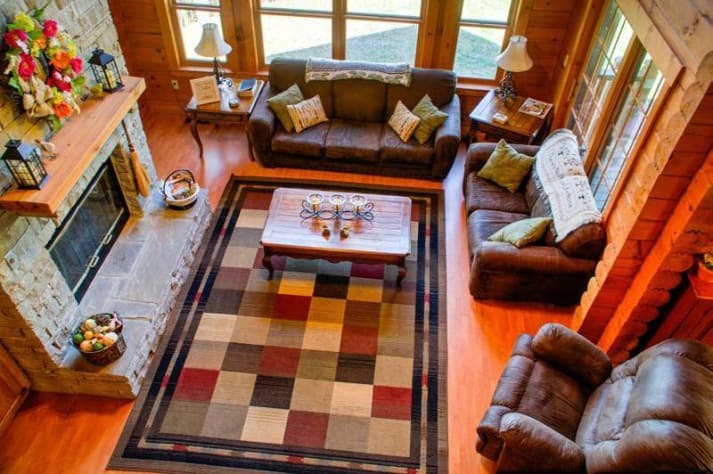 It was a great location and an easy drive to Dollywood and downtown Gatlinburg. Thanks for making our stay so enjoyable! Would love to come back again soon! Beautiful family cabin with amazing views. 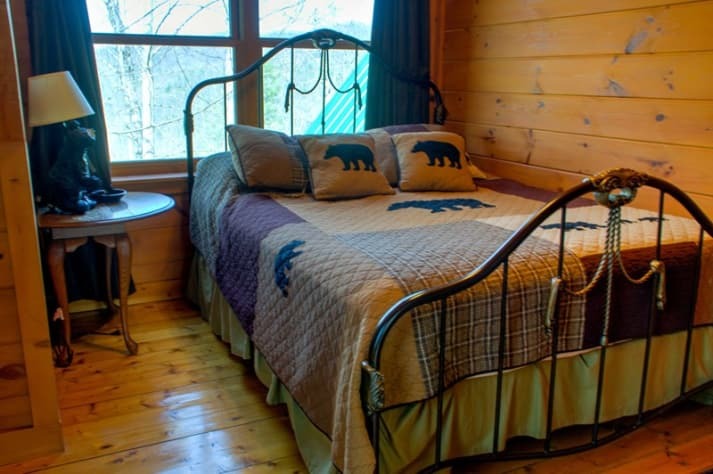 The cabin is very well and thoughtfully equipped. Sandy deserves a special thank you for making our stay comfortable. We will be back. Our family stayed here August 6th - 12th. 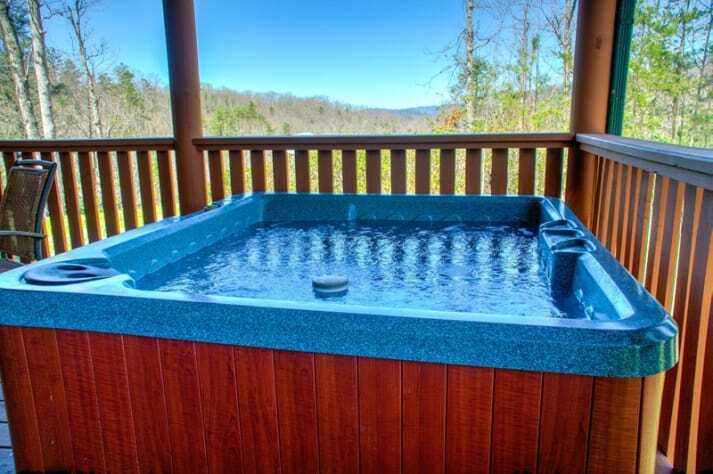 Very nice property close to the Smokey Mountains and Gatlinburg. We liked the space and kitchen area to cook. Was secluded and had a great view, also saw a bear in the backyard and enjoyed a bonfire 1 evening. Would recommend property to others staying in this area. We had a great time and we all enjoyed our stay there. The home is breathtaking and we will keep you in mind for our next trip. This cabin is so beautiful - inside and out. Very clean, the hot tub was amazing. It was comfortable and cozy. The views are beautiful - it even snowed a bit during my stay. 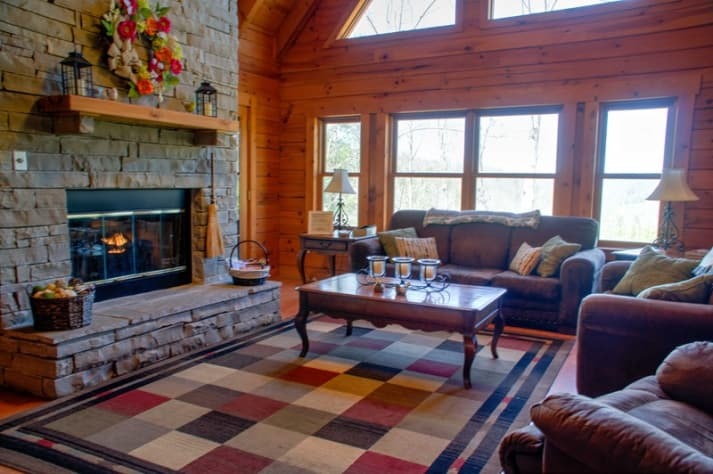 It’s a perfect location right between Gatlinburg and Pigeon Forge. Can’t wait to visit again!! Best Time - Get Away! Several of us ladies got away for a weekend and we had the best time at Mountain Serenity! The views from the top of the mountain are incredible. We hardly left the cabin as there was so much to do there: hot tub, pool table, games, movies, view, fire pit, corn hole, hiking up and down the mountain..... so much! Plus, as a mom of a toddler, it was so nice to get away and have a comfortable night's sleep! 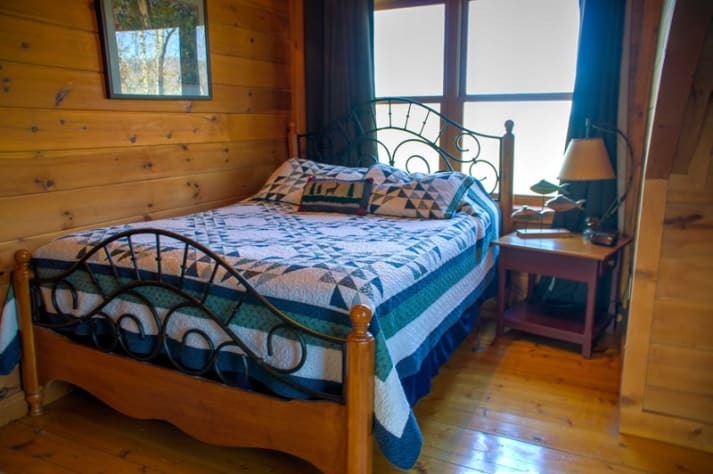 We would all highly recommend this cabin for anyone wanting to get away! Cabin and location was Beautiful and Amazing! 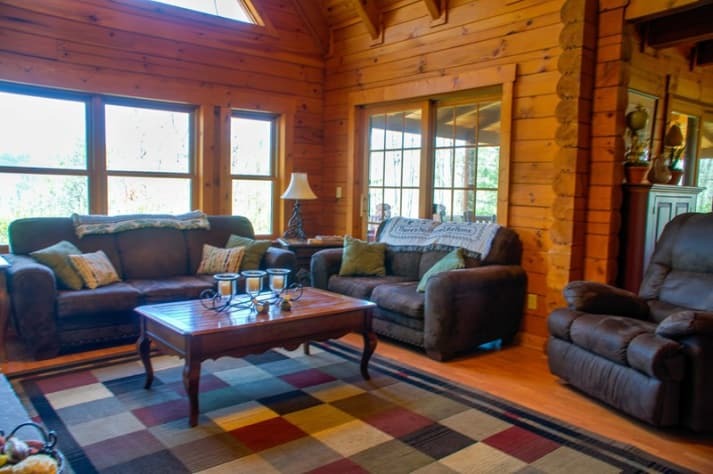 This cabin is beautiful and amazing and has everything you need for a long weekend trip. The rooms are spacious with each having their own bathroom. Beds are Temperpedic like and made sleeping super comfy. The location to downtown was perfect and we also enjoyed grilling out one night after warming up in the hot tub. 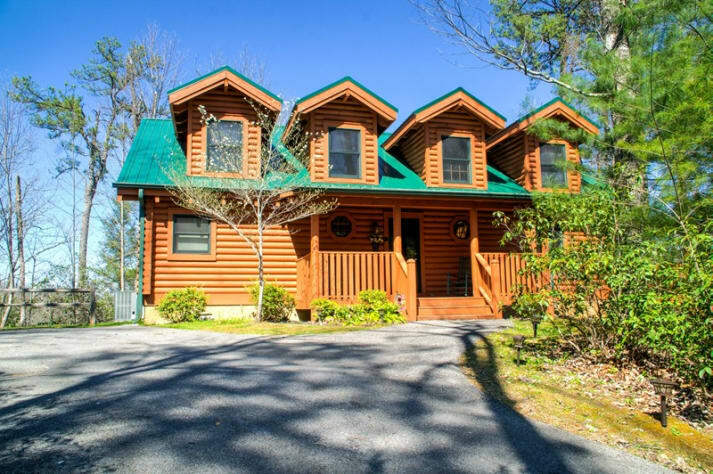 We will definitely be back to stay in this cabin next year for our annual trip!! My wife and I struck gold last weekend! The fall peaked late this year and we were fortunate enough to enjoy the most beautiful spectrum of fall colors. Add warm weather in the 70’s and you have a recipe for the most enjoyable and relaxing weekend that we have experienced in a decade. 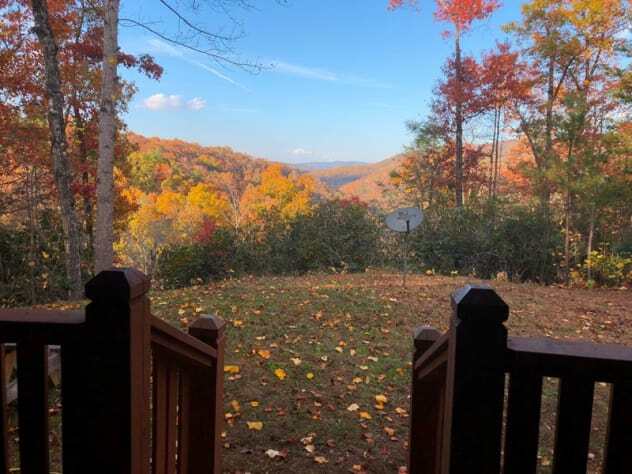 The cabin has a warm and welcoming appeal along with a breathtaking vista that centerpieces the view from the cozy back porch. We enjoyed S’mores by the fire pit on a moonlit night. Breathing in the clean fragrant night air while a nocturnal symphony played a soothing melodic lullaby. We saved money by staying in and cooking with brand new kitchen appliances and cookware. We woke up well rested thanks to the comfortable beds. This cabin is one of the best experiences that we have had. And the price is very reasonable considering the nice cabin, amenities, large backyard, the view, and good location. Great cabin , there were 4 of us we felt very much at home. Awesome location as well. We will definitely be coming back the owners were great to work with.. can\'t wait until next time .. thanks again .. This cabin had everything and more! So pleased that it lived up to the photos and previous reviews! 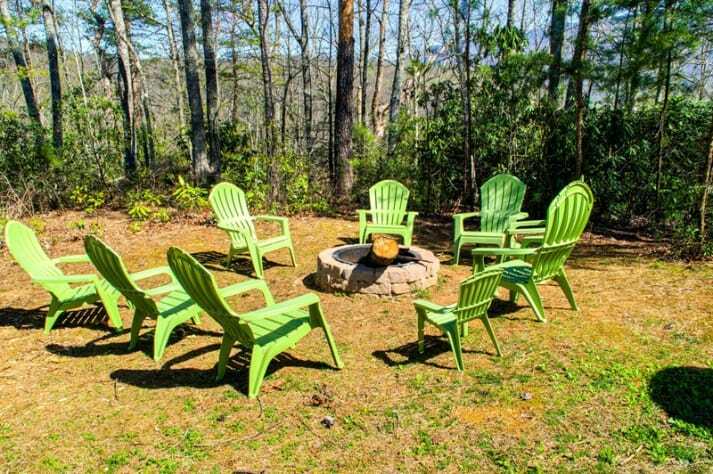 The owners thought of everything when it comes to outfitting the cabin from hangers in the closets to smore forks for the fire pit. It was clean, cozy, comfortable, and quiet. Just what we needed. The view on the back porch was perfect. The location is far enough out to be quiet but close enough to run into town for dinner plus. We utilized most everything in the cabin. We cooked on the grill, used the hot tub, made smores at the pit, played games, played pool, and cooked meals in the kitchen. Kitchen was stocked with everything we needed and more. Laundry was also completed before we left. 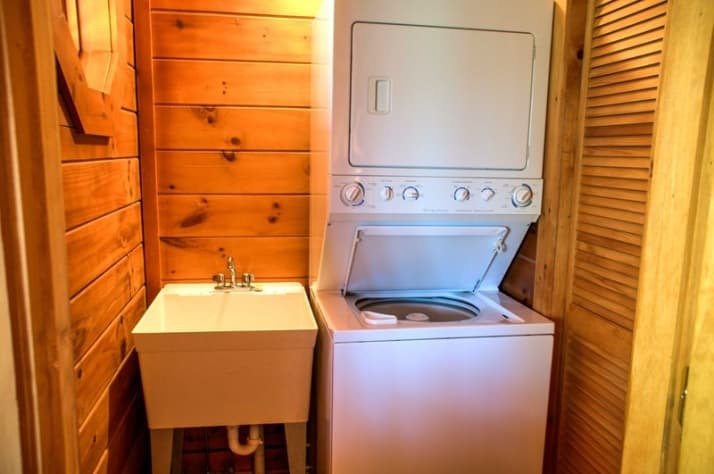 I'm so glad I canceled another reservation to book this cabin. With 3 bedrooms and each having their own bath made a huge difference in our trip. We could all shower at the same time and still had plenty of hot water. Reservation process was simple and easy. Nice people to deal with and answered all my questions quickly. 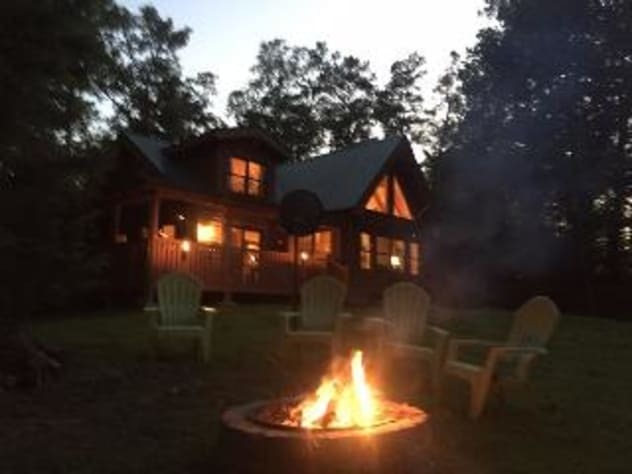 Our kids (son 17 and daughter 24) have asked to come back to The Smoky's and stay in this same cabin. Thank you for sharing your home with us! We made priceless memories!